AUGUSTA, Maine — Pennsylvania’s auditor general said Monday that he doubts how well the Maine Department of Health and Human Services vetted a company that it awarded a nearly $1 million no-bid contract to in September. Meanwhile, two committees of the Maine Legislature are expected to discuss the contract this week. On Tuesday, the contract will be the topic of a discussion for the Legislature’s Health and Human Services Committee, while the budget-writing Appropriations Committee expects to take up the contract and the status of the study on Thursday. The Alexander Group, headed by Gary Alexander, was awarded the $925,000 contract by the state’s Department of Health and Human Services to study Maine’s welfare system, including the possible expansion of MaineCare, the state’s Medicaid system. The contract calls for the group to issue a series of reports between December 2013 and May 2014. The first part of that study on the Medicaid expansion had a target date of Dec. 1, but as of Monday, Dec. 9, the report had not been filed with DHHS, according to the department’s spokesman, John Martins. Martins also said via email Monday that officials from DHHS would not be attending the committee meetings this week, despite being invited to do so. 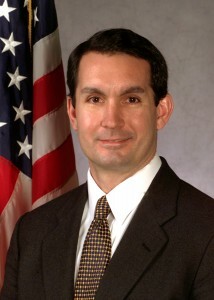 Gary Alexander served as Pennsylvania’s secretary of public welfare until February 2013, when he resigned to pursue opportunities in the private sector, according to the Associated Press. Just weeks after his resignation, Republican Gov. Tom Corbett’s administration fired three other of the department’s top officials. During and after his tenure, Alexander was an outspoken opponent of the proposed expansion of Medicaid under the federal Patient Protection and Affordable Care Act, also known as Obamacare. DePasquale said nobody from Maine’s DHHS made any attempt to check with his office on Alexander’s tenure in a leadership role in Pennsylvania. “That is a record that should have been known prior to people hiring him,” DePasquale said. Republicans, however are dismissive of DePasquale’s criticism, noting DePasquale is a liberal Democrat who won statewide election by a thin margin in 2012. Adrienne Bennett, the press secretary for Maine’s Republican Gov. Paul LePage, declined comment on the issue Monday. Maine Democratic legislative leaders complained that LePage’s administration and officials within the Department of Health and Human Services were avoiding addressing their concerns. State Rep. Peggy Rotundo, D-Lewiston, who co-chairs the Appropriations Committee, said even if Alexander’s company had been vetted, the large price tag on the contract should have been disclosed. The contract was signed in September but not made public until November. Rotundo, a long-serving member of the Appropriations Committee, said she could not recall if any other governor, Democratic or otherwise, had ever awarded a no-bid contract for that much money. Rotundo called the Alexander Group contract the latest example of mismanagement within DHHS. “There’s a track record here of mismanagement,” Rotundo said. She said the contract, safety problems at the state-operated Riverview Psychiatric Center and ongoing difficulties resulting from LePage administration changes to the state’s nonemergency ride program for MaineCare patients were all stacking up. State Sen. Margaret Craven, D-Lewiston, the co-chairwoman of the Legislature’s Health and Human Service Committee, said her committee would be discussing the same issues Tuesday. She also attacked the LePage administration’s mismanagement of state resources and accused him of cronyism.